Thanks for visiting the Kearney Electric Supply Company's web site! KESCO services commercial electrical contractors in all related areas to satisfy their requirements for maintaining profitable operations. We also provide electrical products to industry, manufacturing, utilities, commercial developers, wholesalers and distributors. 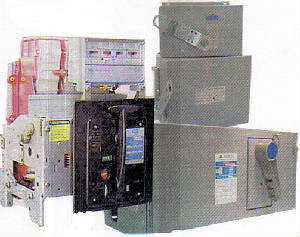 Our products cover low, medium and high voltage applications. KESCO functions as a SELLER and BUYER of electrical equipment, tools and supplies. As sellers we deal extensively in the Surplus Market allowing us very competetive pricing (both new and reconditioned) with shipments often immediate from existing stock. As buyers we act as a broker, utilizing contacts throughout the US, to obtain the highest prices for new or used surplus items. Please contact Tim Kearney, cell: 585-729-0100 or office: 585-467-1407 to discuss your individual requirements. Tim Kearney is a company representative for Contractors Choice of Cincinnati, OH. This enables KESCO to offer all tools necessary for the electrical contractor to complete any job in a timely and profitable manner. 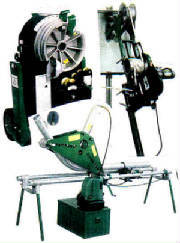 Tools are available New, Reconditioned with WARRANTY, and Rental on a weekly or monthly basis. Financing plans are available for "lease to purchase" and "long term rent to purchase". Call Tim, cell: 585-729-0100, office: 585-467-1407 or Contractors Choice at 800-670-8665 for prompt quotations. We BUY tools, used or new, so contact Tim for a physical inspection and we'll make an offer. 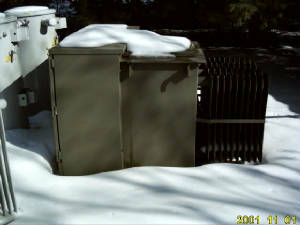 One of KESCO's specialities is the removal of oil filled transformers. Send us a list of transformers along with nameplate information and digital pictures and we'll determine if oil testing for PCB content is required. Upon approval we'll submit an offer to PURCHASE the transformers detailing truck removal from your site. All freight charges are incurred by us. Call Tim, cell: 585-729-0100, office: 585-467-1407 for further information. 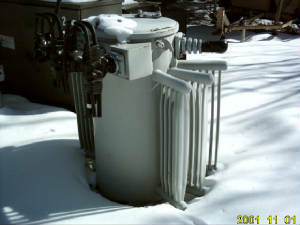 Oil Filled Pole Mounted "TUB"
If testing for PCB content is required we will have the testing performed at no charge. Plastic oil sample bottles are provided; you fill according to directions and submit to our testing facility. We will promptly advise you of the results.